Mallorca Holidays are the perfect time to disconnect from our daily routine - a time to rest, relax and focus on ourselves and our favourite hobbies and leisure activities. 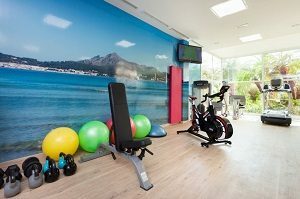 At Vanity Hotel Golf & Spa we are pleased to offer a variety of sports & fitness activities as well as an array of health and wellness options to help you enjoy your sports holidays on the beautiful island of Majorca. If you want to spend your sports holidays pampering yourself, keeping fit and doing sports, Vanity Golf is the resort for you. Due to its spectacular location and impressive surroundings, Vanity Hotel Golf & Spa is the ideal place to enjoy cycling in Majorca. The sport hotel has bikes for hire as well as a bike storage facility with a workshop area which are under video surveillance and available for cyclists. The perfect combination of challenging topography, a well-developed road-network of 1,250 kilometres throughout Majorca, and appealing mild temperatures, attract thousands of cyclists to this stunning island each year. At the hotel gym and fitness centre, you can participate in muscle toning and strength training as well as other fitness activities. The sport hotel also offers exercise options such as aqua gym in the swimming pool as well as yoga classes. Only 10 minutes from the hotel, you will find the nearest golf course in Majorca. Vanity Golf offers a variety of packages from the best golf courses in Majorca, where you can play golf while improving your swing during your sports holidays. If you love to hike in Majorca, you can join the walking excursion that takes place every Saturday and explore some of the most emblematic areas of Majorca. Pamper yourself with our adults-only services at Vanity Golf. We take care of every detail and offer top of the line facilities and excellent service for your maximum comfort. Dedicate your sports holidays to rest and relaxation and make your health and well-being a priority. Your mind and body will thank you for it! Vanity Golf’s health and wellness programme offers an extensive catalogue of massage services designed to meet your individual needs. Choose from an array of unique and customised services which allow you to select the right technique, best aroma, and exact area of the body to focus on. Ours extensive list of massages includes relaxing, classic, hot stone, Hindu, lomilomi, lymphatic drainage or sports massage. To top it all off, relax in the jacuzzi, the sauna or the hydro-massage area and let yourself go! Take advantage of this unique offer at Vanity Golf, and indulge in our 100% natural treatments for every part of the body including facials, spa masks and special spa packages for couples. This catalogue of services at our exclusive hotel, has all the benefits of an adults only hotel resort, allowing you to pamper yourself completely and participate in your favourite sports and fitness activities during your sports holidays.